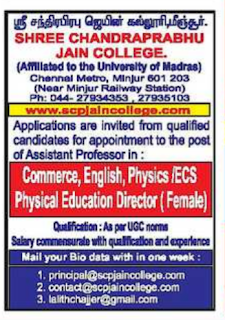 Shree Chandraprabhu Jain College, Minjur has advertised in THE HINDU newspaper for recruitment of Assistant Professor jobs vacancies. Interested and eligible job aspirants are requested to apply with in one week.Check out further more details below. About College: The SCP jain's believes that right knowledge is a basic requirement form the pursuit of spiritual aims, righteous conduct, integration of creed, word and deed and the ultimate emancipation of the soul from the mundane world are also the essential goals for all human beings. 1. 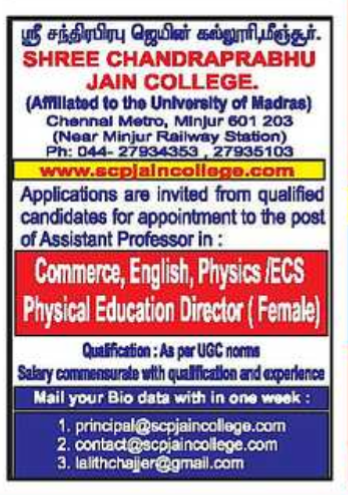 Preference will be given to PG with NET/SLET/Ph.D also apply experienced candidates. How to apply: Interested candidates apply with in a week.